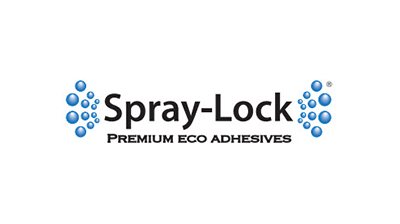 ALL Spray-Lock adhesives are water-based acrylics, which are delivered via aerosol cans. Spray-Lock manufactures and distributes <0.020 g/ml VOC content (Volatile Organic Compounds) Premium Eco Adhesives for floor and wall applications. Our products are delivered by unique spray-adhesive technologies, which greatly improve indoor air quality (when compared to traditional adhesive use), increase productivity, and deliver occupational safety and health benefits.